Hannah and Joe got married at Newstead Abbey and I really enjoyed doing some wedding photography at Newstead Abbey and capturing the day for them. From emotional moments in the morning, lots of giggles with the makeup artist to bubble confetti and more giggles with bridesmaids. This was a fun day and full of love, laughter and music. When I first met Hannah and Joe, I knew they were my kinda couple. Joe works in the music industry and Hannah works for refugees and asylum seekers in Nottingham. We had some political chats as well as wedding talk, and I knew their wedding would be a good one. I asked Hannah and Joe to select their favourite five images from their collection and tell me why they chose the photos they did. Its always interesting to see which pictures my couples choose as their favourites as it reveals the importance of the moments captured and fills my heart with joy to see how treasured those photos are. Here are their selections. This was so so difficult, but we chose these images because they really captured the important little moments that happened on the day between us and our families, as well as some very funny moments between us which really highlight how goofy our relationship is. 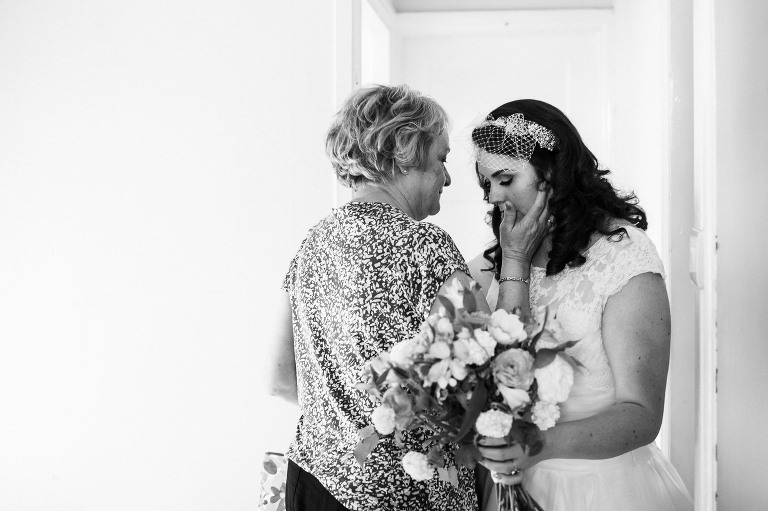 This picture of me and Mum captures a really lovely moment where I was completely freaking out and she was calming me down like she has my whole life. 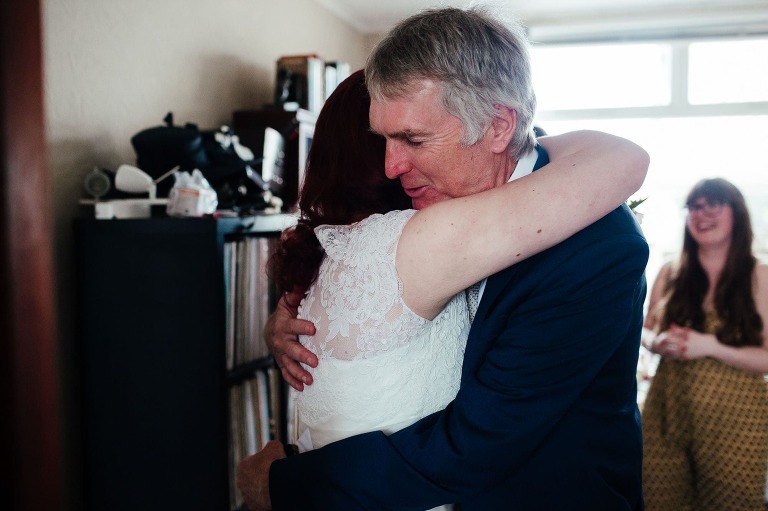 This picture means a lot to me as it caught a moment between me and my Dad, we aren’t really huggers so it was really lovely to find this in our wedding album. 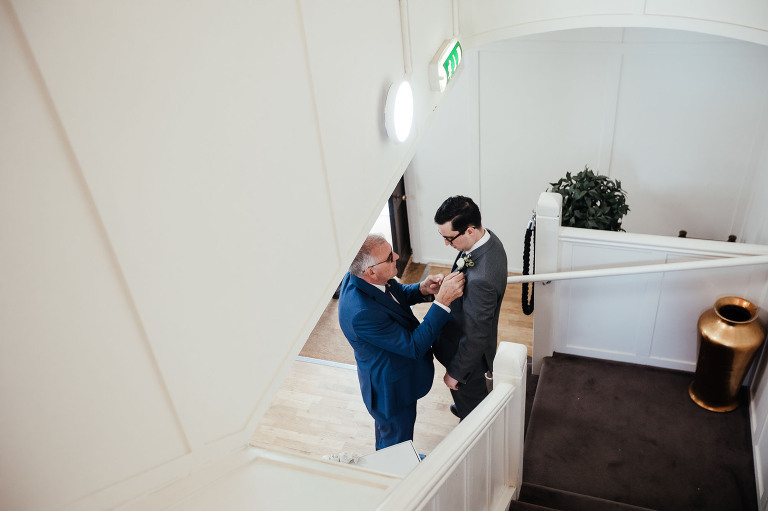 We really love the way this photo captured a quiet moment between Joe and his Dad where Rob is helping Joe with his buttonhole, the calm before the storm. There were so many lovely photos of the wedding ceremony, but this one will always make us laugh, I am forever getting lipstick on Joe so it seems fitting for this to have happened on our wedding day. It might not be the most flattering of pictures, and there are some really lovely ones of us together, but we love this photo, it really shows what we are like together day to day – stupid idiots who love champagne. We did what we wanted and what we felt reflected us at our wedding. We wanted to make sure it was clear when you walked in who it was getting married and it made us more relaxed. You can’t please everyone so you might as well do what you like with your day. Have the important discussions with people as early as possible, because you never know how people might react. Can you remember how you found out about Kathryn Edwards Photography? It is always difficult narrowing down my selection to a roll of film. But here it is. I love the laughing shot of Hannah having her Makeup done by Ms Moo. The light and the expression coming together perfectly for me. The flower girl photographed through the red roses on the coffee table. That shot of Joe looking all nervous whilst my second shooter Carolyn took some portraits in the morning. And again the light. Carolyn knows about light. Yum. Well, when I saw Hannah’s necklace I just loved her a little bit more. She is a fan of Jane Eyre, as am I and the quote from Charlotte Bronte’s novel about Jane and Mr Rochester was perfect. “Reader I married him” swoon! I am a fan of flowers at weddings. And I loved the ones at Hannah and Joe’s, which were made even more perfect knowing that Joe’s mum did them herself, being a very talented florist. How lovely. And they were super. I loved the tea cups and milk jugs full of flowers that adorned the tables as well as Hannah’s gorgeous bouquet! The ceremony was really beautiful, with lots of sweet moments. I also loved the bit where Hannah got lipstick on Joe. The bubbles after the ceremony were adorable. 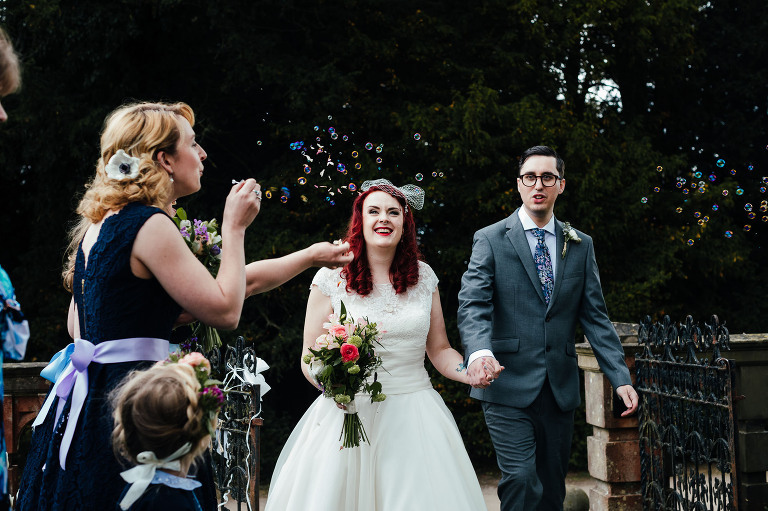 People sometimes ask me which I prefer to photograph, confetti or bubbles, and as soon as I say confetti, I go to a wedding with bubbles and love it. So now I say both! All the bubbles. All the confetti. Love these bits.